Want to bring more prosperity and happiness into your life? 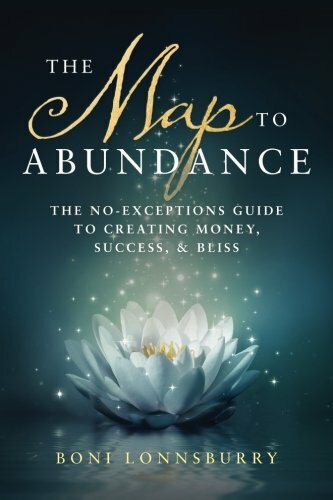 In the book, “The Map to Abundance: The No-Exceptions Guide to Creating Money, Success and Bliss,” Boni Lonnsburry illustrates how you can make this possible. In her self-help manual to success, Lonnsburry maps out a seven-stage process designed to produce a life filled with abundance. The author’s plan of action moves from discovery to actualization, providing tools, techniques and innovative ways of thinking to get you reaping the benefits that you deserve. Each chapter is organized to plot out the road to abundance by providing various ways of analyzing the concept of fulfillment and all of its components. You are taken on an encouragement journey that spurs you to discover yourself and question some of your deepest beliefs. Assisting you along the way are “true stories” of people that have followed the path and discovered its significance. In addition, each chapter contains a summary for retracing your steps and reaffirming the key concepts with bonus tips for solidifying a particular course of action. “The Map to Abundance” is the second volume in the “Map” book series by Lonnsburry. Her first, “The Map: To Our Responsive Universe, Where Dreams Really Do Come True!” is touted as a more generalized guide to manifesting what you desire. The author’s motivation for developing this second text was to specifically address the subject of money and how it factors into consciously creating an abundant lifestyle. Initially, this handbook reads like a “get rich quick” manual. Its structure and language mimic that of an infomercial with the author dangling the carrot of “how to make money” from page to page. In time, however, the book’s framework evolves to incorporate the importance of positive affirmation and the true meaning of abundance. Here the author shines when she supplies valuable insight into the misconceptions of how we view wealth and money and what we feel we deserve in life. Unfortunately, the idea of a “map” to abundance gets a bit lost in the text. At the beginning of the book, Lonnsburry provides a visual flow chart with descending circles that represent the seven stages of abundance and how specific chapters relate to each stage. However, when these same seven steps are introduced in the main body of the publication, it is difficult to reconnect them with the diagram, as the wording and numbering do not intuitively coincide. If the steps or stages were more consistently described and the chapters more apparently labeled, the guide’s format would have greater cohesiveness. Overall, I do find the content to be well written and very informative. I appreciate the way that the author engages the reader by posing questions and offering suppositions along the way. There are a lot of substantial takeaways presented here; the main one being that everyone can benefit from removing negativity in their lives and visualizing themselves in a more positive light. The first few chapters of “The Map to Abundance” appear to wind you along a fanciful path that promises great wealth and financial success. But do continue on because this guidebook has the potential to lead you to an even greater purpose - one of fulfillment and inner peace. I would recommend it for anyone at a crossroads in his or her life. Its uplifting techniques will enable you to gain a clear and joyful perspective. With this publication, award-winning author, Boni Lonnsburry furnishes the tools needed to unearth one’s power and confidence for transformative changes that can result in a truly abundant life.